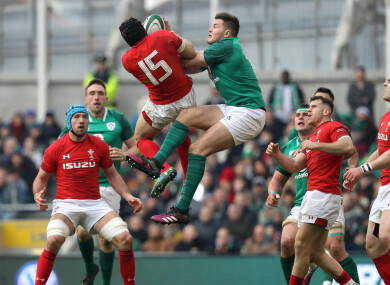 Jacob Stockdale and Leigh Halfpenny compete for a ball during last year's Six Nations. THE TICKETING DETAILS for Ireland’s pre-World Cup ‘summer series’ Tests have been announced this afternoon. The matches against Italy and Wales will represent Joe Schmidt’s last home fixtures as Ireland head coach before he sees out his tenure in Japan. Tickets will go on general sale on Wednesday 13 March, though supporters club members can buy pre-sale tickets next Monday and Tuesday. Seats in the Aviva Stadium for the meeting with Conor O’Shea’s Azzurri on 10 August begin at €15 for adults, rising to €60 for category one and €75 at the premium level. The visit of Warren Gatland’s Wales on 7 September are €95 at premium level, €80 for category one-rated tickets, while the cheap seats come in at €25. Schoolboy and schoolgirl tickets are available for €10 for both fixtures. Two-match bundles are available for category one (€126) and premium level (€153) tickets. Full details available on IrishRugby.ie. In between the two home fixtures, Ireland will also face England and Wales in away Tests on 24 and 31 August respectively. Email “Tickets for Ireland's World Cup warm-up Tests to go on sale next week”. Feedback on “Tickets for Ireland's World Cup warm-up Tests to go on sale next week”.